Aside from the environmental factors with the Adani coal mine, there are also political and community concerns to be addressed, writes Noely Neate. 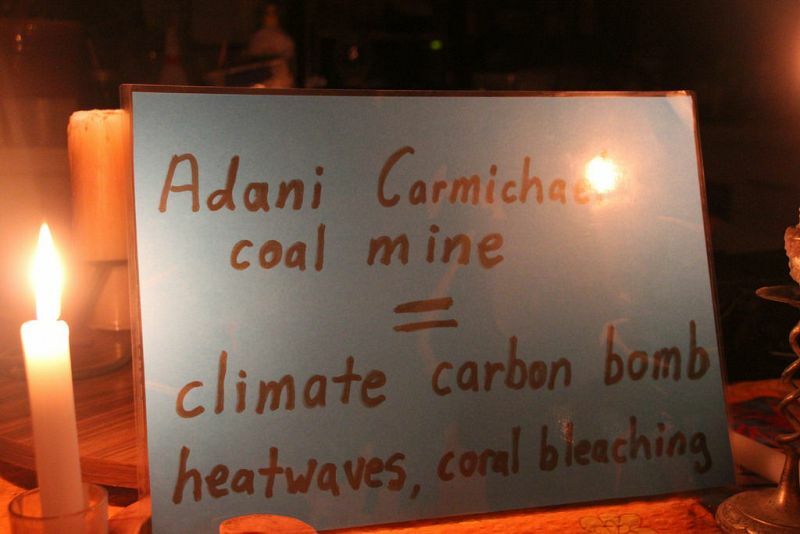 NOW, I DON'T REALLY want to talk about Adani. The Carmichael coal mine in the Galilee Basin in Central Queensland is actually rather horrific and the likes of #StopAdani are to be supported in their efforts to stop this monstrosity getting off the ground, noting it has had several starts since it was signed off on by Queensland’s Campbell Newman Government back in 2014. It is bad for the environment and Great Barrier Reef, plus, obviously, not going to supply the promised thousands of jobs it has said it would and, to be quite frank, even the smallest Google search shows Adani itself seems to have a habit of being investigated for all sorts of environmental and business reasons. I’m not a big fan of the financial spivs, but hey, if none of them want to back this mine with their money – as we have found over the years – well, that kind of says a lot doesn’t it? What I want to talk about is how Adani has become something bigger than just an uber-large infrastructure project, but more a political lightning rod and the damage that is causing. This tweet below by Denise Shrivell about the north-south divide really made me realise that not only are the people in favour of the mine misinformed, so are the people in the “south”. I often see people on Twitter, Facebook and other social media saying “stop Adani”, when, in fact, what they really mean is stop coal production. They are right — the planet really has to move on from this, but what I rarely see is people asking how we can transition from coal production. The whole Adani “thing” has become a war ground between Conservatives, particularly the LNP type and their media supporters against those who care about climate change. Most who argue about it don’t even have a clue besides a vague area on the map in Queensland as to where this proposed mine will be and probably don’t even care about the so-called jobs to be gained, or my favourite: “keeping poor people in India supplied with energy”. That one is particularly mendacious. What the Adani supporters care about is prosecuting their ideological stance against climate change and their God-given right not to care about the environment if there is a quid to be made out of it. For the politicians, again, for some it is a way to have a product differentiation and try to wedge the ALP, who are in a tight spot not really wanting to grant the final go-ahead at all, but also not wanting to put themselves in a horrible financial situation with sovereign risk. Particularly Queensland ALP, we have enough problems financially just coping with natural disaster costs without adding massive lawsuits from Adani as well. Not to mention, many in Central and North Queensland have been told for a number of years here by their LNP MPs and senators that Adani jobs are the answer to their prayers, backed up by massive front page splashes in the Courier Mail and Townsville Bulletin backing Adani to the hilt. So, anything to stop Adani by the Queensland ALP Government is going to look like the ALP don’t care about regional jobs and the future of regional towns. Think end of shearing era-type ghost towns on the horizon if mining ceases overnight. BREAKING ,Scientific Reviews Give @QLDLabor Trigger To Block The Carmichael Coal Mine , It Appears @Melissa4Durack Jumped The Gun. This is where we come to the crux of the matter in “reality”. The fighting over the Adani mine will continue. I could be wrong, though would be very surprised if Queensland does finally sign off on this, judging by the response from Leeanne Enoch, Queensland Minister for Environment, even though the Federal Government Environment Minister, Melissa Price, has conveniently given the go-ahead on the eve of an election. What is missing in all the “political games” politicians and media like to play are people. There are real people on the ground in central and north Queensland who are worried about their jobs, providing for their families and their futures. They have been told for years now they need to support the likes of Adani, they have been told consistently that the big city Greenies don’t care about them and seriously, it has gotten to the stage where I’m expecting LNP Senator Matt Canavan to channel Joh Bjelke-Petersen and direly condemn those “Communist pinkos down south” trying to destroy regional Queensland. Unfortunately, many anti-Adani supporters are forgetting these people. Failing to understand the messages these communities are receiving. And don’t tell me “it's up to people to educate themselves”. This is so unfair. Not everyone has the education nor luxury of time to do this. Also, for many, they still believe “if it is in the news it must be true” and, to be quite frank, they should be able to believe that news. Telling a lot of people in the Queensland regions “educate yourself on the dangers of climate change” and so forth is akin to victim blaming, in my opinion. These are generally conservative areas and why would they not believe what they have been told by both the media and their elected representatives as to how they need this Mine – and others – for the future of their regions? Obviously, truth in media and politics is a whole other issue to be debated. But my warning here is this — every single time you trash people in the regions as to supporting this mine and others, you are buying into what the News Corp media and LNP politicians are telling these people, which is pretty much, those “Greenies don’t care about you or your family's future”. You are making their case for them. Now I know both the Greens and ALP do have transition-style plans for regional areas to get out of the mining game, though, to be honest, I don’t know much about them. In fact, even though I’m on Twitter and like to think I pay attention, I'm only vaguely aware they exist. I have never seen these policies reported in Queensland media. So if I never have, do you think these people who consider Adani the answer to their future have? So please, trash Adani or the LNP coal fondlers as much as you like, but have empathy for those caught in the crossfire, lied to by the Government and media and are just worried about their immediate futures, too. Don’t just yell at them to give up their livelihoods for climate change, encourage a “bright” future transition, not division. Blaming mining communities as redneck Queenslanders, stupid, backward and so on, just proves the LNP right and ensures the re-election of those who would use Adani.